My father is 91 and a Yorkshireman. 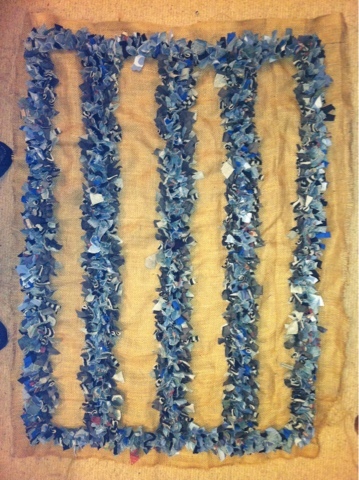 The first time I saw rag rugs, I was with my parents, having tea in a stone cottage on the Yorkshire moors. We were guests of Bob and Elsie Merrington, a Dales gamekeeper and his wife with whom my father had become friends. The flagstone floors in their cottage were partly covered with rugs which, Elsie explained a little shyly, she had made on winter evenings. "There's Bob's old corduroy breeches there" she said, pointing to a dark mustard strip in one rug. My mother, always a craft-fiend, was enchanted, but she was already well set on her own complex and profound needlepoint journey, a voyage of discovery and skill which eventually led to an entire medieval Norfolk church being almost entirely covered in needlepoint and cross-stitch of considerably better taste than most; so she never got into rag rugs. My parents are very old. I have started a simple proddy rug for my father in blues and greys which will in time be joined by a hooked rug for my mother, probably in earth tones. Both small bedside cotton rugs, to be done as efficiently and quickly as possible. I was going to use purple notes in my father's rug but on reflection greens will be more appropriate - if he can be said to have a favourite colour it is surely green. So far, I've done the blue and grey tones.